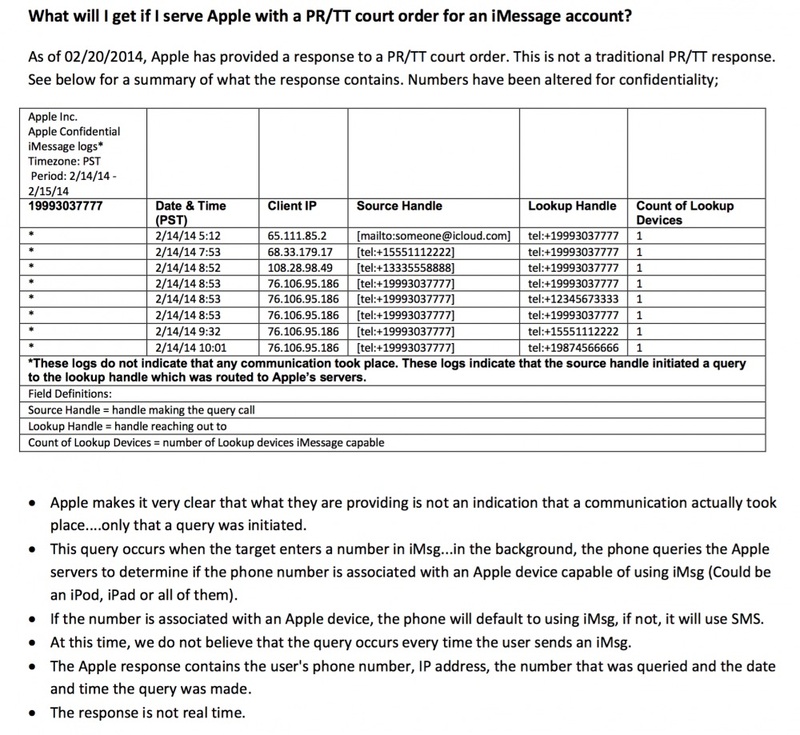 Apple confirmed to The Intercept that it only retains these logs for a period of 30 days, though court orders of this kind can typically be extended in additional 30-day periods, meaning a series of monthlong log snapshots from Apple could be strung together by police to create a longer list of whose numbers someone has been entering. The data on how Messages works was reportedly obtained by The Intercept from a document entitled "iMessage FAQ for Law Enforcement" that was given to the Florida Department of Law Enforcement's Electronic Surveillance Support Team. While labled "Law Enforcement Sources" and "For Official Use Only," it is not clear who wrote it. When law enforcement presents us with a valid subpoena or court order, we provide the requested information if it is in our possession. Because iMessage is encrypted end-to-end, we do not have access to the contents of those communications. In some cases, we are able to provide data from server logs that are generated from customers accessing certain apps on their devices. We work closely with law enforcement to help them understand what we can provide and make clear these query logs don't contain the contents of conversations or prove that any communication actually took place. Apple takes a strong stance on privacy and promises to keep customer data private with tools like end-to-end encryption for the Messages app, but it has always maintained that there is some information that it is able to provide to law enforcement officials when compelled to do so. Apple's website features a privacy section that details the information it collects and the types of data that it provides for government requests, including a full rundown of what's available to law enforcement [PDF]. Apple's documentation does not appear to mention Messages specifically, but it does specify that iCloud connection logs are retained for 30 days and that FaceTime calls logs are also maintained. This seems like a non-story, wouldn't basically any service of this type have to keep this sort of data for a brief period of time? No issue here. Sometimes people send a text and the message has to sit there until the recipient's phone is on as well. Either way, the content is secure and that's what we all care about. The rest is the equivalent of the list of who you called that's on any phone bill. Does this surprise anyone? Even the messages are held for up to two weeks if they can't be delivered. It seems like a non story. If you don't want records kept, use Signal. We're talking about a messaging app, synced across Mac/iOS devices, capable of sending SMS and iMessage, with the entire conversation history available until you delete it. Pinging a device and Apple's servers, to figure out what a device is and how to talk to it, just comes with the territory of this technology. And again, Apple can't see any of the content from the messages, nor do they store it or even have the facility to decrypt it. Complete non-issue. No issue here either but still good to know. Also smart to occasionally remind oneself that no matter numerous claims to the contrary, no single internet communication is 100% secure. I'm having a hard time seeing how this is more than what is already available to law enforcement though the telcos. No better than Google, nor any other phone company to begin with. Again, since your data is going through a third party, they are not protected by the 4th Amendment when it comes to needing a warrant for search. All that is needed is a subpoena by a clerk of the court (and by default, any lawyer is a clerk of the court). All of this was mentioned in the following thread, 3 years ago. This isn't Apple's fault. This isn't Google's fault. This isn't any Telco's fault. The fault of this lies in how the 4th Amendment is applied, and that it does not cover 3rd parties in charge of handling your data. I think perhaps you don't understand the article. Again, not picking on you. Just using your comment as the vehicle to drive my point.